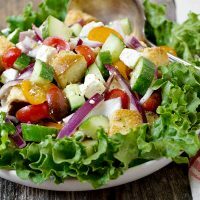 A hearty and delicious Greek-inspired panzanella salad, with cucumber, tomatoes, red onion, feta cheese and homemade croutons, tossed in a tarragon vinegar vinaigrette. Serve 2 as a main or 4 as a side. Make the croutons: Preheat oven to 375° F. Place diced bread cubes in a large bowl. Drizzle with olive oil and season with salt and pepper. Toss to combine well. Spread in an even layer on a baking sheet and bake in the pre-heated oven until, stirring once, until lightly golden, about 6-8 minutes. Set aside to cool. To prepare the salad, combine the prepared cucumber, tomatoes and red onion in a large bowl. Toss to combine. Add the feta cheese and some salt and pepper. Toss to combine. Finally, add some cooled croutons and toss. Drizzle with dressing and toss to combine. Serve immediately.